Fryderyk Franciszek Chopin (1 March 1810 – 17 October 1849; pronounced SHOH-pen) was a Polish composer and virtuoso pianist. He is considered one of the greatest Romantic piano composers. Chopin was born in Żelazowa Wola, a village in the Duchy of Warsaw. A famous child prodigy, he grew up in Warsaw where he completed his music education and composed many of his mature works before leaving Poland in 1830 at age 20, shortly before the November 1830 Uprising. After the Uprising, he lived in Paris as part of Poland's Great Emigration. During the last 19 years of his life, Chopin performed only about 30 times, usually in a salon. He supported himself by selling his compositions and teaching piano. After a romantic relationship with Polish women, including an abortive engagement, from 1837 to 1847 he carried on a relationship with the French writer Amandine Dupin, better known as George Sand. 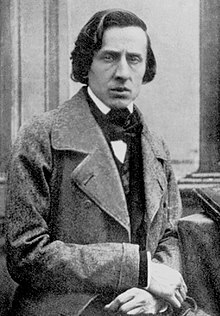 Chopin suffered from poor health most of his life and died of tuberculosis in Paris in 1849 at age 39. Since he composed many piano pieces, he was called the poet of the piano. Most of Chopin's works are for solo piano, though he also wrote two piano concertos, a few chamber pieces and some songs to Polish lyrics. His piano works are often technically difficult, especially because deep expression is involved along with the importance of considering each detail in his music. Chopin also created the instrumental ballade, along with the addition of new ideas to the piano sonata, mazurka, waltz, nocturne, polonaise, étude, impromptu, scherzo and prélude. All of Chopin's works involve the piano. ↑ "He was a Polish patriot to his bones and the divinely inspired romantic poet of Polish music." Tad Szulc, Chopin in Paris, p. 19. This page was last changed on 11 April 2019, at 00:26.